Merritt Speedway has announced that Engine Pro Sprints On Dirt will make up last Saturday’s rain out on July 8th. 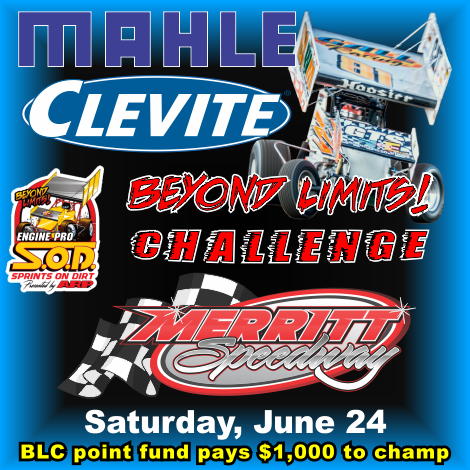 With the announcement, SOD has been able to move the MAHLE/Clevite Beyond Limits Challenge back to Merritt, maintaining the series’ format of five races at five different speedways. Thomas Schinderle and Joe Swanson are tied for the MAHLE/ Clevite BLC point lead after two races. Steve Irwin, Dain Naida, and Chris Jones are 3rd through 5th. The first MAHLE/Clevite BLC race, scheduled for May 20th, was rained out, but run the next day at Baer Field Motorsports Park and was won by Shawn Valenti. The 2nd race was at Thunderbird Raceway where Chad Blonde made a last lap pass of Schinderle to take home the win. Beside the completed Baer Field Motorsports Park and Thunderbird Raceway races, 2017 MAHLE/Clevite BLC races are the Merritt Speedway race, one at Crystal Motor Speedway, and the last one at the Manistee County Fairgrounds Speedway. The BLC also includes its own point fund with $1,000 going to the champion. Engine Pro Sprints On Dirt presented by ARP is brought to you in 2017 by many important sponsor partners including: Engine Pro (Title Sponsor), ARP (Title Sponsor), Hoosier Racing Tire (Official SOD Tire), MAHLE/Clevite (Beyond Limits Challenge Sponsor), Driven Racing Oil (Battlegrounds Bash Sponsor), King Engine Bearings (King of Michigan Sponsor), Lane Automotive (Fast Masters Sponsor), MSD Ignition (Fast Masters Sponsor), Engler Machine & Tool (Primary Heat Race Sponsor), COMP Cams (Primary Heat Race Sponsor), RockAuto.com (Primary Heat Race Sponsor), The Perfit Corporation (Lucky Dog Sponsor), KSE Racing Products (Hard Charger Sponsor), and XYZ Machining (Season Sportsman & Crew Chief Sponsor). In addition, SOD contingency sponsors include: Allstar Performance, ATL Racing Fuel Cells, BR Motorsports, Diversified Machine Inc. (DMI), Hepfner Racing Products (HRP), K2W Precision/Keizer Aluminum Wheels, King Racing Products, Kistler Racing Products, Maxim Racing, Motor City Racing Promotions, Racing Optics, Rod End Supply, Schoenfeld Headers, Simpson Racing Products, Walker Performance Filtration. June 25, 2017 – Early morning sunshine gave way to a narrow but heavy band of showers that zeroed in on Lake City, Michigan’s Merritt Speedway, forcing afternoon cancellation of the Engine Pro Sprints On Dirt SOD MAHLE/Clevite Beyond Limits Challenge race yesterday. 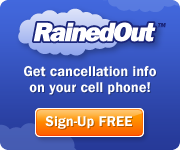 Merritt Speedway did not reschedule the race. As a result, the Sprints On Dirt September 2nd race at Crystal Motor Speedway has been added to the MAHLE/Clevite Beyond Limits Challenge series. Engine Pro Sprints On Dirt presented by ARP rolls into Merritt Speedway for round three of the MAHLE/ Clevite Beyond Limits Challenge five-race series. Berkley, Michigan’s Thomas Schinderle is tied with Joe Swanson (Etna Green, Indiana) for the MAHLE/ Clevite BLC point lead. They are followed by Steve Irwin (Fenton, Michigan), Dain Naida (Adrian, Michigan), and Chris Jones (Allen, Michigan). Schinderle also leads the SOD season point standings and The Perfit Corporation SOD Series Rookie of the Year standings. The first MAHLE/Clevite BLC race was at Baer Field Motorsports Park and was won by Delta, Ohio’s Shawn Valenti. Round two was at Thunderbird Raceway where Chad Blonde made a last lap pass of Schinderle to take home the win. Two SOD events were scheduled at Merritt last year, but one was rained out. 2016 SOD Champion Brian Smith (Fremont, Ohio) won the show that was completed. Schinderle, racing a 305 cubic inch engine, finished a strong second. Merritt Speedway management has made numerous changes to the already top-notch facility. New lighting, additional new grandstands, and track resurfacing are just three of the upgrades that SOD competitors are anxious to see. The BLC is being contested on five different speedways; Baer Field Motorsports Park, Thunderbird Raceway, Merritt Speedway, Crystal Motor Speedway, and Manistee County Fairgrounds Speedway. The BLC also includes its own point fund with $1,000 going to the champion. Chad Blonde made it 3 big Engine Pro Sprints On Dirt presented by ARP wins in two weekends at Butler Motor Speedway Saturday night. Blonde drove from his 6th place starting position to take the $2,100 win in the Driven Racing Oil Battlegrounds Bash WW III presented by Jim Coffey & Son Plumbing & Heating feature. On a night where strong winds and high temperatures made track preparation a challenge, Butler’s crew was up to it and the race track held up remarkably well. The action was fast and furious on the smooth, high banked 3/8-mile with the large crowd enjoying plenty of passing. The SOD feature was over shortly after 10:30 PM. With 23 cars still in competition after heat race action, Butler promoter Bob Garrett added 3 cars to the feature instead of running a B-Main. Butler points leader Doug Zimmerman grabbed the early lead in the 25 lap feature from his pole position with Gregg Dalman starting and running 2nd. Thomas Schinderle started 6th, but was up to 3rd by lap3. Chad Blonde moved into 2nd on lap 7. Zimmerman led the first 14 laps, but contact with a slower car in turn 2 caused him to spin to a stop, turning the lead over to Blonde. On lap 16, Zimmerman went off turn 3 and by the time he came back on the track out of turn 4, the caution was thrown, and he retired to the pits. On the restart, Boston Mead spun in turn 2, collecting Dain Naida and Joe Swanson, ending the night for all 3. Chris Jones won the KSE Hard Charger award by passing 12 cars. Steve Irwin started 8th, but a flat left tire on lap 6 sent him to the rear, but recovered to finish 7th. The 2017 Driven Racing Oil Battlegrounds Bash three-race series will roll out this Saturday. Butler Motor Speedway’s WW III presented by Jim Coffey & Son Plumbing and Heating will pay $2,100 to win. In the past, SOD races at Butler, when held on Michigan International Speedway special events weekends have been known to attract both famous and not-so-famous spectators from MIS. This year, all three Driven Racing Oil Battlegrounds Bash races at Butler are scheduled on MIS weekends. Last year’s two SOD races were exciting to say the least. In the first race, 2016 SOD champion Brian Smith passed former Butler champion Doug Zimmerman in the last corner of the last lap for the win. Not about to let it happen again, Zimmerman thrilled the crowd as he charged to the win in the second show. SOD races at Butler traditionally bring regulars from both SOD and Butler face to face for bragging rights. Butler point leader Doug Zimmerman will be defending his home turf, driving for Tom Dale. Boston Mead, currently 5th in Butler points, has also run a couple SOD races and is the son of 1987 and 1988 SOD champion Mark Mead. His car owner is reining Butler champion Shelby Bilton who is currently 2nd in 2017 Butler points. 2001 SOD champion Steve Irwin leads SOD points going into the weekend with top SOD series rookie contender Thomas Schinderle in 2nd; Dain Naida, 1999 SOD champion, is in 3rd. 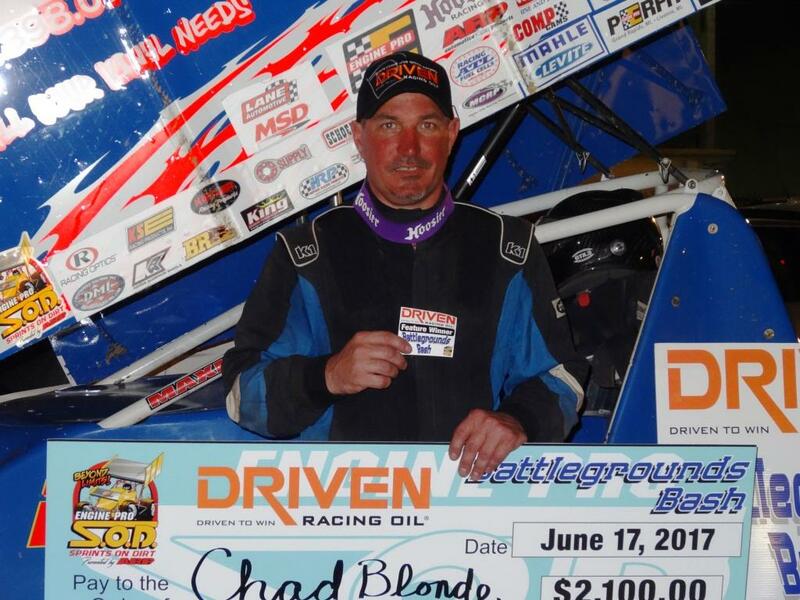 Also chasing the first Driven Racing Oil BB win will be veteran Chad Blonde, whose sprint car career began at Butler. Although not pursuing either Butler or SOD points, Blonde won at Butler on May 13 and won both SOD races last weekend in his Sean Robinson-owned ride; Robinson is another former SOD champion. Driven Racing Oil Battlegrounds Bash dates are Saturday, June 17, the first Michigan International Speedway 2017 NASCAR weekend, Saturday, July 22; the MIS Faster Horses Festival weekend; and Saturday, August 12, the final 2017 MIS NASCAR weekend. The Driven Racing Oil Battlegrounds Bash will pay a five-place point fund for the three races, and the Driven Racing Oil Battlegrounds Bash champion will have a guaranteed starting spot in the Engine Pro Sprints On Dirt presented by ARP Mike Olrich Memorial Race at Crystal Motor Speedway on September 2. Engine Pro Sprints On Dirt by ARP’s other two 2017 series, the King Engine Bearings King of Michigan and the MAHLE/Clevite Beyond Limits Challenge were part of last weekend’s action. 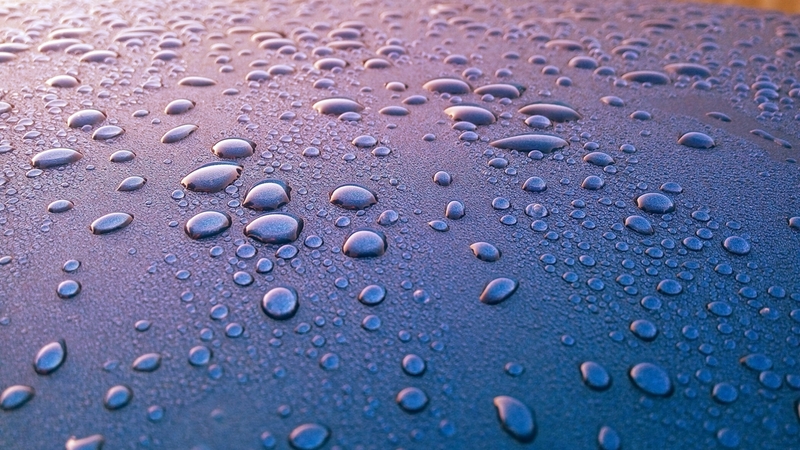 Get to know Driven Racing Oil at http://www.drivenracingoil.com. For more information about Butler Motor Speedway, go to www.butlerspeedway.net. To learn more about Engine Pro, go to www.enginepro.com. For more information about ARP, go to www.arp-bolts.com.